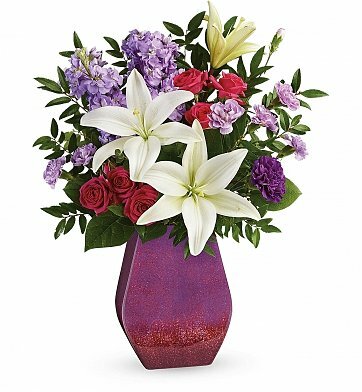 Treat her like a Queen with this royalty-worthy gift of roses and lilies! Mom will love the lush, fragrant blooms and stunning, hand-glazed ceramic art piece with glossy gradient finish. Lavender Stock, Lemon Leaf and more. Standard Arrangement Measures 15" x 20". Regal Blossoms Bouquet is a hand delivered gift. These gifts are delivered by one of our local design centers located throughout the United States and Canada. Same day delivery is available for most gifts when ordered before the cutoff time. The cutoff time for Regal Blossoms Bouquet is 2 PM in the recipient's time zone.